In its March trend report, JWT, the world’s best-known marketing communications brand, revisits the phenomenon of FOMO (Fear Of Missing Out), the uneasy and sometimes all-consuming feeling that you’re missing out—that your peers are doing, in the know about or in possession of more or something better than you. For brands, FOMO has powerful potential, since it heightens participation on social media platforms and motivates consumers to do more. Brands can focus on easing FOMO, escalating it, making light of it or even turning it into a positive. JWT’s trend reports are the result of quantitative, qualitative and desk research conducted by JWTIntelligence throughout the year. For this report, JWTIntelligence interviewed experts and influencers in technology and academia, and conducted a survey in the U.S. and the U.K. using SONAR™, JWT’s proprietary online tool. The survey polled 1,270 adults aged 18-plus and 110 teens from Jan. 19-24. The Millennial Generation is most affected by FOMO: As many as 70% of adult Millennials (aged 18-34) in the U.S. and U.K. said they could completely or somewhat relate to FOMO, with nearly 4 in 10 reporting they experience it often or sometimes. A majority of teens also relate to the concept (65%), with 40% saying they experience FOMO often or sometimes. Young adults and teens expressed feelings of missing out more than any other generation when seeing via social media that their friends are doing something they’re not, buying something they’re not or finding out something before they do. Millennials are aware that social media is FOMO-inducing: In the U.S. and U.K., 54% of teen and adult Millennials agreed that it’s easy to feel left out on a site like Facebook, and nearly half said social media has amplified any fear of missing out they might have. Life in overdrive: too much to do, read, buy, watch, etc. : Just over half of respondents said they never have ample time or energy to delve into new interests and often only get to skim the surface. This is especially true among adult Millennials (66% in agreement) and Gen Xers (60%). And people are overwhelmed by how much they need to digest to stay up to speed, especially the hyper-connected adult Millennials (55%); teens and Gen Xers don’t fall far behind (48%). Mack’s SXSW talk takes place Saturday, March 10, from 3:30-4:30 p.m. at the InterContinental Stephen F. Austin, Capital Ballroom B (hashtags: #sxsw #fomo). 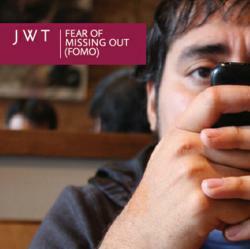 The “Fear Of Missing Out” report is available on JWTIntelligence.com. Additional knowledge and research on JWTIntelligence.com includes recent trend reports on food, music, social commerce and the travel sector, 10 Trends for 2012 and 100 Things to Watch in 2012. JWT is the world’s best-known marketing communications brand. Headquartered in New York, JWT is a true global network with more than 200 offices in over 90 countries employing nearly 10,000 marketing professionals. JWT consistently ranks among the top agency networks in the world and continues its dominant presence in the industry by staying on the leading edge—from producing the first-ever TV commercial in 1939 to developing award-winning branded content for brands such as Smirnoff, Macy’s, Ford and HSBC. JWT’s creative philosophy of making things inspired by the world enables the agency to forge deep relationships with clients including Bayer, Bloomberg, Cadbury, Diageo, DTC, Ford, HSBC, Johnson & Johnson, Kellogg’s, Kimberly-Clark, Kraft, Nestlé, Nokia, Rolex, Royal Caribbean, Schick, Shell, Unilever, Vodafone and many others. JWT’s parent company is WPP (NASDAQ: WPPGY).